A friend said, he would never forget the sight of the alien looking TR-3B based at Papoose. The pitch black, triangular shaped TR-3B was rarely mentioned–and then, only in hushed whispers–at the Groom Lake facility where he worked. The craft had flown over the Groom Lake runway in complete silence and magically stopped above Area S-4. It hovered silently in the same position, for some 10 minutes, before gently settling vertically to the tarmac. At times a corona of silver blue light glowed around the circumference of the massive TR-3B. The operational model is 600 feet across. Okay, admittedly the physics discussed in the video above is just speculation, speculation based on “Known” physics, primarily inside the box. Could it be something more exotic? of course, something far more refined than mercury vapor at hundreds of thousands of atmospheres of pressure spinning at ridiculous speeds? yes. Something like harnessing energy from the vacuum, complete localized control of gravity and inertia. The bigger question is how could they keep this a secret for so long? 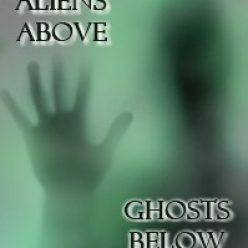 for some answers and compelling thought on this question see the video below which discusses UFO’s and the national security state, how extensively important the deepest parts of the government consider this technology and the UFO issue to be despite their continued denial of being interested or having any knowledge at all, all the while having perfected gravity control since 1955 or 56. NOTE: In 1965 the NSA had Computers with a clock speed of MHz, computer technology of that level was not available commercially until 2000, 35 years later! NOTE: Some key aspects of Maxwell’s Equations were wrong! If this is true as it seems to be, a good deal of the physics people use to discredit the possibility of these technologies may be rendered invalid! The TR-3B is Code named Astra. The tactical reconnaissance TR-3B, first operational flight was in the early 90s. The -triangular-shaped, nuclear powered aerospace platform was developed under the Top Secret, Aurora Program with SDI and black budget monies. At least three of the billion dollar plus TR-3Bs were flying by 1994. The Aurora is the most classified aerospace development program in existence. The TR-3B is the most exotic vehicle created by the Aurora Program. It is funded and operationally tasked by the National Reconnaissance Office (NRO), the NSA, and the CIA. 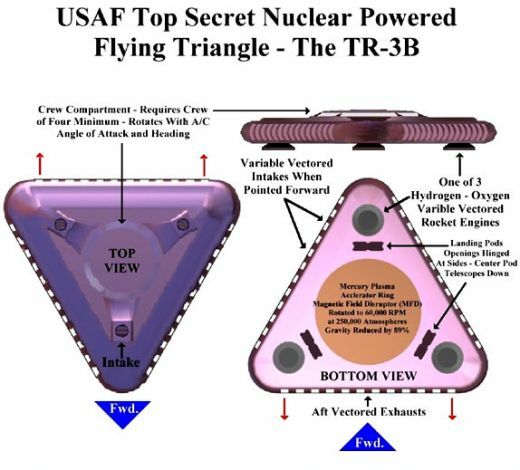 The TR-3B flying triangle is not fiction and was built with technology available in the mid 80s. Not every UFO spotted is one of theirs. The TR-3B vehicles outer coating is highly reactive to radar stimulation and can change it’s reflectiveness, absorption coefficient, and color (electro-chromic?). This polymer skin, when used in conjunction with the TR-3B’s electronic Counter Measures and (ECM), can make the vehicle look like a small aircraft, or a flying cylinder, or even trick radar receivers into falsely detecting a variety of aircraft, no aircraft, or several aircraft at various locations. A circular, plasma filled accelerator ring called the Magnetic Field Disruptor (MFD), surrounds the rotational crew compartment and is far ahead of any imaginable technology. Sandia and Livermore laboratories developed the reverse engineered MFD technology. The government will go to any lengths to protect this technology. The plasma, mercury based, is pressurized at 250,000 atmospheres at a temperature of 150 degrees Kelvin and accelerated to 50,000 rpm to create a super-conductive plasma with the resulting gravity disruption. The MFD generates a magnetic vortex field, which disrupts or neutralizes the effects of gravity on mass within proximity, by 89 percent. Do not misunderstand. This is not anti-gravity. Anti-gravity provides a repulsive force that can be used for propulsion. The MFD creates a disruption of the Earth’s gravitational field upon the mass within the circular accelerator. The mass of the circular accelerator and all mass within the accelerator, such as that within the cockpit, avionics, MFD systems, fuels, crew environmental systems, and the nuclear reactor, are reduced by 89%. This causes the effect of making the vehicle extremely light and able to outperform and outmaneuver any craft yet constructed–except, of course, those UFOs we did not build. The TR-3B is a high-altitude, stealth, reconnaissance platform with an indefinite loiter time. Once you get it up there at speed, it doesn’t take much propulsion to maintain altitude. At Groom Lake there have been whispered rumors of a new element that acts as a catalyst to the plasma. With the vehicle mass reduced by 89%, the craft can travel at Mach 9, vertically or horizontally. My sources say the performance is limited only the stresses that the human pilots can endure. Which is a lot, really, considering along with the 89% reduction in mass, the g-loading forces are also reduced by 89%. The TR-3Bs propulsion is provided by 3 multi-mode thrusters mounted at each bottom corner of the triangular platform. The TR-3 is a sub-Mach 9 vehicle until it reaches altitudes above 120,000 feet, then god knows how fast it can go! The 3 multi-mode rocket engines mounted under each corner of the craft use hydrogen or methane and oxygen as a propellant. In a liquid oxygen/hydrogen rocket system, 85% of the propellant mass is oxygen. The nuclear thermal rocket engine uses a hydrogen propellant, augmented with oxygen for additional thrust. The reactor heats the liquid hydrogen and injects liquid oxygen in the supersonic nozzle, so that the hydrogen burns concurrently in the liquid oxygen afterburner. The multi-mode propulsion system can; operate in the atmosphere, with thrust provided by the nuclear reactor, in the upper atmosphere, with hydrogen propulsion, and in orbit, with the combined hydrogen\ oxygen propulsion. What you have to remember is, that the 3 rocket engines only have to propel 11 percent of the mass of the Top Secret TR-3B. The engines are reportedly built by Rockwell. Many sightings of triangular UFOs are not alien vehicles but the top-secret TR-3B. The NSA, NRO, CIA, and USAF have been playing a shell game with aircraft nomenclature – creating the TR-3, modified to the TR-3A, the TR-3B, and the Teir 2, 3, and 4, with suffixes like “Plus” or “Minus” added on to confuse further the fact that each of these designators is a different aircraft and not the same aerospace vehicle. A TR-3B is as different from a TR-3A as a banana is from a grape. Some of these vehicles are manned and others are unmanned. Posted on November 25, 2014 November 29, 2014 Author Dr. Barry TaffTags Aurora Class aircraft, Black Projects, Gravitatinal Decoupling, Inertial Decoupling, Lockheed Martin's Skunk Works, Magnetic Field Disrupter, Man-Mad UFOs, Richard M. Dolan, TR-3B, UFOs, USAP ProgramsLeave a comment on “OUR” UFOs?